Elegant banknote album in a classic design. 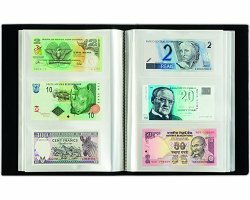 Features 100 sturdy integrated clear sheets to store and display up to 300 banknotes in style. High-quality finish featuring seamed binding and a black leatherette cover. Overall size: 245 x 330 x 50 mm (9 2/3 x 13 x 2").